The game of Go is an Asian strategy game. Since about four thousand years people enjoy playing this game. 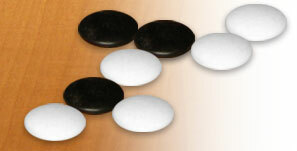 Go is not only one of the most ancient games but today also one of the most favourite games played worldwide. The game stimulates creativity, intelligence and character. To learn the rules of the game of Go takes only a few minutes. The rules are simple, the game is easier than chess. But the game of Go provides a wide, almost endless range of possibilities, which makes it almost impossible for a computer programm to beat an amateur player. The more you learn about Go, the more you will discover the cleverness and profoundness of the game. To master the game it's not sufficient just to learn standard patterns and techniques - because it's a game of strategy. I offer all kinds of workshops and lessons, not only to learn how to play the game, but also to learn to know the history, philosophy and culture of the game. Taking part in my workshops you will discover, that the game of Go is more than just a game. If you want to learn to know the game of Go from it's strategy side, or if you look for a way to approach the Asian mindset and philosophy, or you search for a tool for self cognition and meditation, or if you just look for a modern and elegant freetime acticity - here you will find a first and proper introduction.